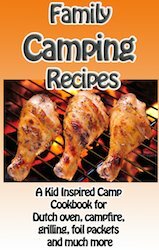 Dutch oven cooking for kids is easy, safe and provides you with some tasty food that you can enjoy in your backyard or while you are in the midst of a wilderness camping adventure. One of the wonderful features about this style of cooking is that it can be shared by both kids and adults. Dutch ovens have been used for centuries and knowing how to use this type of cookware will help boost a child's level of confidence. Just because you are on a camping trip or trekking through the woodlands does not mean you have to settle for roasted hot dogs and packaged beef jerky at the end of the day. With Dutch oven cooking you can create dishes that will satisfy even the finicky eaters in a group. You have two styles of Dutch ovens to consider. Many of these ovens sit on 3 short legs and they have a lid that fits very tightly so ashes do not accidentally get into the food you are cooking. This type of Dutch oven cookware is known as a ‘campstyle' or ‘outdoor' oven. The other kind is called a ‘kitchen oven' or a beanpot'. These are also made of heavy cast iron and have a tight fitting lid, but they have no legs. You can set these directly on hot ashes, on charcoal briquettes or balance them on bricks, but their design also makes them perfect if you want to use them in your home oven or top of your range. Cooking tips on Dutch ovens cooking for kids and with kids. It can be tricky trying to keep a constant cooking temperature with a fire but using a good brand of charcoal will help. Remember that too much heat at once can ruin your Dutch oven meal so slow and easy is the rule of thumb to follow when you are cooking with charcoal. Since 350 degree heat is recommended for most Dutch oven recipes you should use twice as many pieces of charcoal briquettes as the size of the oven. In other words if you are using a 10" Dutch oven use 20 pieces of charcoal, and if you have a 12" Dutch oven you should use 24 charcoal briquettes. The oversized Dutch ovens may require more charcoal in the fire but this general "doubling" tip will help you get the cooking started. Ovens with more metal mean more air space, more surface area and more food to heat. You may have to experiment to actually find what will work for the Dutch oven you are using. One charcoal briquette can produce about 15 degrees of actual heat but only if the weather is calm and there is no rain or wind to contend with. If your recipe is going to require more than 60 minutes of actual cooking time you should remove the ashes and add fresh charcoal. You should only need to use 2-5 pieces of charcoal the second time to keep the cooking process activated. 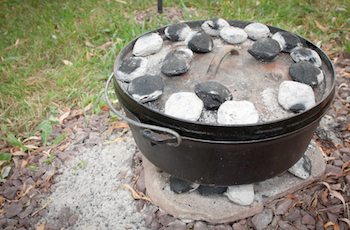 It is important to know how to arrange the charcoal for best heating results with a Dutch oven. Keep the ground level briquettes about ½" or less away from the pot and always arrange them in a circle. When you place the charcoal on the lid you should arrange them in a pattern that is similar to a checkerboard. When someone attempts to bunch the charcoal together this creates hot spots and uneven cooking. Roasting meat and vegetables can be done in a Dutch oven if you place half of the charcoal on the lid and the other half around the bottom of the pot. Simmering a soup or chili is best done when you use 2/3 of the charcoal at the bottom of the Dutch oven and the remainder on the lid. Baking a pie in a Dutch oven is best accomplished with 1/3 of the charcoal on the bottom and the rest of the charcoal on top of the Dutch oven lid. Cooking with kids can be fun when you use Dutch ovens. You can use an open fire or you can move the hot charcoals to a separate area and continue cooking without worrying so much about burned food. Show your kids how a Dutch oven can be buried in hot coals and then left to cook the food slowly while you enjoy a day of fishing or exploring in the woods. You can assign them the task of keeping track of the time the food has cooked. They can also help digging and arranging the coals. Dig a hole that is big enough to hold the Dutch oven and use this as your campfire pit. Place some flat stones at the bottom and sides of the hole. Start the fire on top of these stones and add some wood until the pit is about ½ full with hot embers and hot coal. Let the fire die down and then place the Dutch oven in the center of the ashes. Use some of the remaining hot coals to cover the top. You should have about 3 inches of coals on top of the pot. Now cover the coals with 2-3 inches of dirt. Thoroughly wet a couple of burlap bags; spread these over the top of the hole, and anchor them in place with some heavy rocks. You can come back and dig out the pot of cooked food much later in the day when you are finally ready for lunch or dinner. 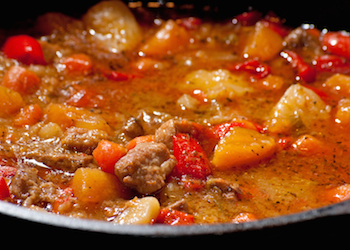 Dutch oven cooking is similar to cooking with a pressure cooker or a crock pot. If steam is coming out of your pot then you know that the temperature is not hot enough yet. With the right temperature the steam will be kept inside the Dutch oven. The food is allowed to cook from the inside out over a slow heat which makes it tender, moist and flavorful. Turn the Dutch oven once ever 15 minutes if you are cooking over an open fire. You should turn the pot 90 degrees during each rotation. When you turn the pot you need to lift the lid and keep it stationary while you rotate the pot 90 degrees. You can also check on the contents in the pot when you lift the lid for the position rotation. You can even stack Dutch ovens to save space, cooking time and heating energy. Only stack the ovens if you are cooking similar dishes at one time. You should not stack Dutch ovens that contain foods that need to be baked with those containing foods that should be roasted. Here are some tips to keep in mind when dutch oven cooking for kids and with your kids help. 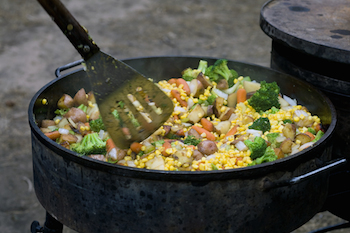 Children are naturally intrigued by any cooking done with Dutch ovens and campfires. Teach them to respect this cooking technique but encourage them to help with such tasks as preparing the food to go into the oven. Let your older children help you stir the foods in the Dutch oven using wooden utensils with long handles. Some children will be able to help with the campfire, lifting the lids with special tongs or other chores. Never let a child be around a hot Dutch oven when they are not supervised. Always monitor your children closely any time they are assisting with Dutch oven style meals. Make sure that both you and your children wear gloves to work with Dutch oven cookware. Thick leather gloves, camp gloves or welder's gloves are ideal but any work gloves can be used. Help your children use their imagination to think of new and creative dishes to cook in Dutch ovens. Any time you are cooking with kids, you need to keep in mind safety. Dutch oven cooking for kids and with kids is no exception. Never leave a Dutch oven unattended on an open fire. Always use safe equipment and apparel to cook with a Dutch oven. Wear thick gloves to handle any pots. Use tongs to lift the lids when the foods are cooking. Long sleeved shirts can help protect your arms from accidental steam burns. Do not leave a campfire unattended. Always extinguish all flames thoroughly after you have finished cooking. Charcoal lighters can be purchased that will safely start the cooking fire. Do not use chemical accelerants such as kerosene or gasoline. Keep people a safe distance from any open flames during the cooking process. Make sure that your pots are balanced securely and not in danger of tipping over when you are cooking Dutch oven style recipes. Spray the bottom of your dutch oven and add the meat, potatoes and onions. Season with salt and pepper. In a bowl, whisk together the tomato paste, beef broth and Worcestershire sauce until well blended. Pour half of the sauce mixture over the meat. Then place the remaining vegetables on top of the meat. Pour the rest of the sauce on top. Cover with the lid and cook until meat and vegetables are done. Spray Dutch oven with cooking spray. Add pasta, then water and oil to dutch oven. Stir to coat pasta. Add cheeses and seasonings. Stir to combine. Top with bell peppers, broccoli, tomatoes and spinach. Cover with the lid and cook for about 30 minutes or until cheese has melted and pasta is tender.